Last Sunday, I broke out the paint shaker on two wheels, aka the 690 Duke, as it was sitting around not being used due to the heat, and machines need to be exercised. It was already hot at 10 am, but, I manned up and started off toward the hills, where I had not been for awhile. So, I was caught by surprise, when I got to Mt Emma, and there were road work warnings saying that one could expect delays as the road was being worked on under the "Mt Emma Project". Well sir, they are grinding Mt Emma down, removing all the interesting contours that used to try to upset the suspension and kill me, and, then, they are putting a thick coating of fresh asphalt on it. Where completed it is as smooth as a pool table and there are no traction issues. 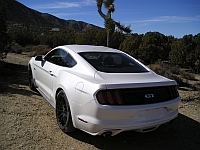 it is so fast and smooth, that among other things, I waved a new Mustang GT350 by, but, as just after he passed in a roar of distinctive exhaust note, the throttle of my Duke stuck open, and I was forced to stick on his bumper all the way to the Forest Hwy, where I managed to un-stick the throttle, and, he turned right, and I turned left, as I had decided that I'd run up to the top of the Nine Mile, and back, as I was just cruising around on a very easy Sunday ride, and I had no wish to makes new friends with Max Enforcement. However, not long ago, they did the same thing that they are now doing on Mt Emma to the Forest Hwy, so, it too is smooth and not bumpy and the traction is good. So, it is almost boring at the speed limit, which I never exceed (unless the throttle sticks). So, I ran along, easy, but, when a Fiesta with tiny tires passed me, I did sort of follow it, but, it was one of those Forest Hwy regulars who never hit the brakes, or slow their pace, and who have perfect lines for all the corners and who seem to average about 75 mph, so, I gave up, as I have no ridden much lately, and his tires were not even squealing while I was getting nervous about both the speed and Max Enforcement. Nine Mile has not been changed, but, other than occasional sand on the road here and there, it is already pretty smooth, and way too fast for the KTM, so, the throttle only stuck once, for a bit, when a pace line of Sports bikes caught me just as I was hitting some curves. Darned sticking throttle is going to get me in trouble some day, but, after matching their pace, I waved them all by, and they scooted off at 100 per, as Nine Mile can handle some serious speeds. When I was turning around up toward the top, a big 4 door BMW cage, of some sort, rolled by, heading down the hill, and, because he had most a 15 second head start on me, I sort of expected to see him soon, but, even though I may have gone a bit over 55 mph, I never saw him again at all, even when I was in spots that gave me a good view of the road ahead. I have no idea how fast he must have been going, but, I assure you, it was way fast. So, with a nose full of bean oil, as the GT350, and at least some of the sports bikes, and many others were running stinky bean oil, and the odor was lingering in the air for the length of the Nine Mile, I cruised home, cooking in my gear, as it was too hot to ride for an elderly person not able to handle the heat. As well, the 690 Duke runs nice and cool even when pushed hard, but it starts to get really hot in stop and go traffic and at lights, and the heat from the exhaust cooks my right leg, medium rare. I guess that KTM warned me, with their "Ready to Race" slogan, but, I did not heed the warning and I purchased their race bike anyway. So, that is a short report on all the smooth as glass roads with the 55 mph speed limits and miles of double yellow. And, even though it was during the peak riding hours, on a Sunday, and the routes were crowded with recreational vehicles, both cages and bikes, and even though many were fracturing the speed limits, and even though the Fiesta was passing over the double yellow without breaking pace while averaging 75, I did not see a single cop all day. This sort of surprised me as they could write some serious tickets if they hid on Nine Mile, as in 100+ type tickets, or arrests. But, now I know that I could make some good speed with my soft, floaty, Mustang, on those roads, as good traction, and smooth as glass should let even the Mustang get close to averaging 75, like a base Fiesta. Nice report, sounds like fun! I was prepared to put the KTM up for sale after I failed the stupid written test for a motorcycle endorsement on my license when I was recently forced to go in person to DMV to renew my license, but, for some reason, in spite of missing all the questions that showed an image of some situation and asked which was the proper response to such a representation, I passed. Seems that in spite of my 50+ years of riding the dirt, and of rubber side down street riding, including over 300 passes, most over 130 mph on my Busa, at LACR, I know nothing about how to ride, per DMV. Lucky that I snuck past them one more time. So, since the KTM is still around, I have to keep it in proper running condition, and that means exercising it now and then. But, I may still stop riding motorcycles, as at 75+, and senile, it might be the prudent thing to do, not that I can claim to understand prudence, even in my dotage. Somehow we missed you Sunday. A mix of BTE and Brit guys. We went up and over Little T, up Soledad, Aliso, AF, then up and back down 9 mile, and finished with Big T.
xbacksideslider wrote: Somehow we missed you Sunday. Funny though, since I set out to run up and down the Nine Mile, and so did you. I almost went up the back way to Wrightwood, by Jackson Lake, or pond these days, but, it was hot, and that is a longer ride. Well, I should have called you or posted up the ride on here but on second thought, you would have bullied my little 500 with your 700, so it's best I didn't. xbacksideslider wrote: Well, I should have called you or posted up the ride on here but on second thought, you would have bullied my little 500 with your 700, so it's best I didn't. Me? A bully? Never! It is just a fact of life that for a drag racer, such as I am, power to weight is the key ingredient to success, given traction, and 690cc is much more than that of a wee little KTM, which is actually a substantial percentage larger in actual displacement than 500cc's. Also, Norton John is a tad larger than even I am, so, and we already did this, the 690 wins standing start drag races and will pull the smaller bike in a roll race at any speed until the 690 hits its 8000 RPM rev limiter in top gear at 112 MPH true. But, rides with the crazed ones, are not about drag racing at all, and, the crazed ones also run a wicked pace everywhere, including areas where I always fear enforcement, and, to make things worse, they go looking for road with curves, the more technical and nasty, the better. I have plenty of videos of them disappearing into the distance, and, they certainly, at times exceed the top end speed of my 690. So, I get dropped immediately as handling curves in the road is not what a drag racer does. Even my soft floaty so called muscle car can not handle curves, and, why should it, as that would wear out the big soft wiggly MT DR's out back really quickly ? But, I do not say that I am being bullied, as different strokes for different folks, and, the thoughtful among the crazed always waited up for me after they blazed away at warp speeds for awhile. So, they were not bullies, but, rather a lot more skilled and gifted at riding than me. Yep, there it is, right there for all to see - a bully in denial.